If you are a webmaster, professional or business man, there will be times when you need to conduct survey, feedback or to gather some important information from your visitors, members, client or co-worker. With the help of Google Docs, you can easily create forms and can be embedded into web pages or your blog, or you can even send it as a link on email. 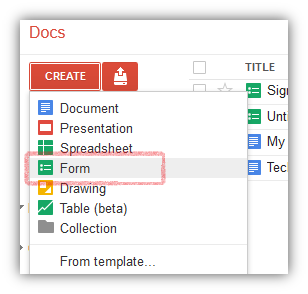 Any input submitted by the users on the forms, gets automatically stored into the spreadsheet in Google Docs. This Form can be used to make online registration, to conduct a survey, to create co-worker database, to create membership database or to collect general information through feedback. The best part of all is that, it’s easy to set up and its Free. 3. In Header, replace “Untitled form” name and give an appropriate title name for the form. 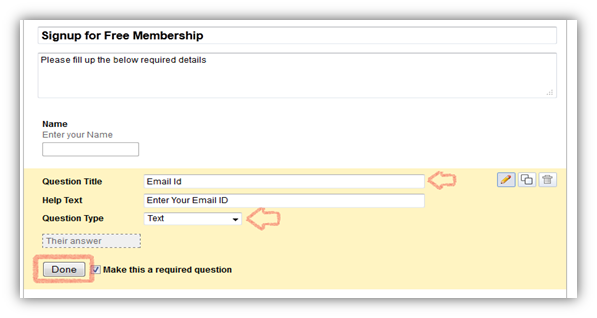 Moreover, you can add description just below the header; however, it is an optional field. 4. In Question Title, Enter the Question you want to display, e.g. Enter Your Name. 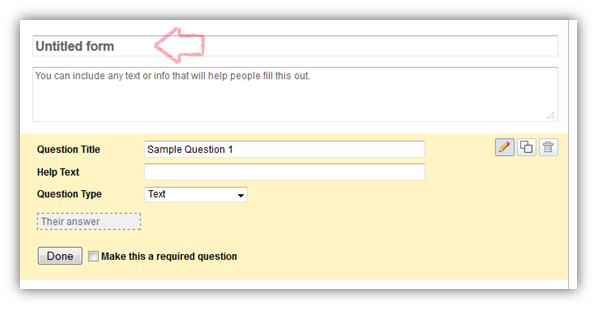 In Help Text, it’s an optional field, Enter if you want to display description for the field. Choose Question type, select appropriately here. 5. You can add a checkmark on “Make this a required question” to make this field mandatory. Once done click Done. 6. In the same way, create other questions, Click on Add item drop-down menu and select appropriate input field you require. 7. 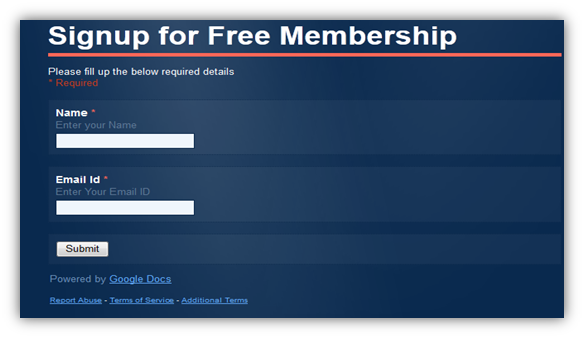 Save the form and you are ready to share it on emails or embed it into website or blog. Additionally, you can add themes to your forms, also you can edit confirmation message accordingly. Below is the form which I have created to signup user for free membership. 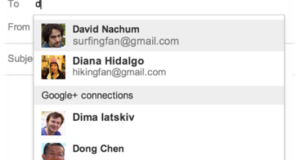 All data inserted by the users on form are directly saved in the spreadsheet in Google Docs, which is Private by default.